Well guess what? Taco Bell has launched a new item on their menu that involves "extreme cheese." Having not tried this new quesadilla yet, I’m hesitant to officially endorse it, but I’m intrigued. If anyone out there has tried the Extreme Cheese and Beef Quesadilla from Taco Bell, let me know how you liked it. I’ll be going to Taco Bell soon to try this out for myself. Once I’ve tasted it, I’ll be sure to post a review on the site asap. From the Archives — Could Ice Cream with Nacho Cheese Taste Good? Recently a situation arose where I was put in a position to try nacho cheese with vanilla and chocolate ice cream. Some of the friends I was with appeared disgusted at the thought of the mix and others were intrigued to watch me tempt my taste buds with two seemingly opposite flavors. I used an inexpensive nacho cheese from a local Safeway grocery store. Rather than pour hot nacho cheese all over my ice cream, instead I took a clean spoon and dipped it in the nacho cheese bowl. Then I filled the rest of the spoon with a mix of chocolate and vanilla ice cream. It did not taste good. It could have been the worst thing I’ve tasted in a while. This mix of nacho cheese with ice cream just does not work. In fact, I drew a blank when I began thinking about other flavors of ice cream that might taste better with nacho cheese than the vanilla and chocolate did. Author Joe Brian and StevePosted on June 6, 2007 Categories Test Lab6 Comments on From the Archives — Could Ice Cream with Nacho Cheese Taste Good? If there’s any nacho out there that could be classified as doltish, this is it. Just as it was declared earlier that fondue is not nacho cheese, this little recipe is in no way, shape, or form nachos. Lest anyone think that by melting a dab o’ fromage on a tortilla chip automatically constitutes a nacho, they are sadly mistaken. 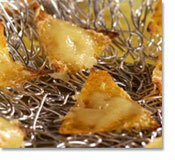 Nachos should never have to be "plated" or "presented." Nachos are to be prepared by grabbing a handful of chips, thowing them into a bowl, and smothering it with molten hot nacho cheese. This recipe is a disgrace and an insult to all nacho lovers. Now excuse me while I slice a cube of Reblochon and pair it elegantly with a bold glass of 2003 Cotes du Rhone Villages Cairanne. About a week ago I took it upon myself to conduct a head-to-head comparison of two popular grocery store nacho cheese varieties – Tostitos Con Queso & Fritos Chili Cheese. Both were microwaved in their containers for three minutes, mixing well at one minute intervals. Both were delicious and while each definitely had a unique offerings, the Tostitos brand Con Queso rose up as the winner in my opinion. In the end, I felt that the Tostitos Con Queso had a better consistancy and wasn’t as runny as the Fritos Chili Cheese. Review written by: Eric L. Email us a story. Eric is proving to be a true ILoveNachoCheese.com Superfan. First he sends us “It’s Nacho Love (That I Need)” – an original song he wrote just for the site – now he’s written a review of some nachos he ate during a recent business trip! It’s honest, humorous, informative, and well written. He even took a picture. Nice work, Eric. Nice work, indeed. After a quick phone interview with Sarah & No Name last Thursday, the three of us were invited into the studio the following morning to do an on-air “private nacho tasting” of our Official Recipe with the morning crew. That morning we met up and carpooled into the Alice @ 97.3 Station located in beautiful San Francisco. Already excited, on the way up we got even more amped when we heard them discussing our upcoming appearance. At that point, all we could think about was how terrible it would be if they ended up hating the recipe. When we arrived, we were greeted by Hooman and led into the Green Room to set up shop and begin cooking up our heavenly orange-colored gravy. Below we’ve included two audio clips. The first is a little pre-appearance banter; the second, our on-air interview. Wondering how it all turned out? Well…you’ll have to listen. But to give you a clue, they’ve invited us back for their Cuatro de Mayo broadcast! Oh yeah…one last thing. Christy, the gal that called in with your…ummm…”joke?” Could you email us and explain? We’re all still trying to figure that one out! I just got home from the last game of the regular season for the San Jose Sharks. And what a game it was! Trailing 2 to 3 against the visiting Canucks, Jonathan Cheechoo scored with only 30 seconds left in the third to force overtime. But before we get to the final outcome, lets reverse time to before the start of the game. When I arrived, I made my way to the Una Mas! Mexican Grill located in the HP Pavilion. I ordered nachos, a large soda, and then headed to my seats in section 212 before digging into the box of chip and cheese goodness. Shopping at my local supermarket, I came across a Doritos flavor I’d never seen before — Wild White Nacho. 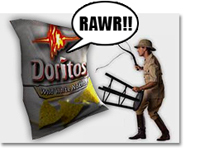 Already having an opinion on pre-packaged “nacho cheese flavored” chips, the correct choice would’ve been to walk away. Instead, I was compelled to try this wild new flavor and report my findings to the NCLC (Nacho Cheese Loving Community). For starters, I think I liked these chips better when they were called “ranch.” And as for being “wild,” they were anything but. I was expecting a chip that would tickle my tastebuds with some zest, or have a little spicy kick and bite back. But alas, I was left with a relatively boring chip that didn’t have any sort of lasting impression. To read more about this chip, click here. Last night I watched the exciting NHL match-up between the home-ice San Jose Sharks against their Pacific Division rivals, The Ducks. And while the final score was a bit disappointing (2-3), there was one thing that made my trip to The Tank all worthwhile — The San Jose Sharks Hotdog. 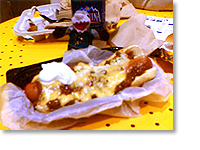 The SJ Dog is a site to behold and a taste to savor. This is the 8th game I’ve gone to so far this season, and I think I’ve eaten a SJ Dog at six of those eight games. It’s become a game night staple. And by taking a look at the picture I’m sure you can see why. This foot long dog is first covered in all-beef chili, sprinkled with finely chopped white onion, drenched in nacho cheese, and topped with a bit of sour cream for good measure. This hot dog is pure heaven. For the most part, I eat lunch at the company cafeteria. 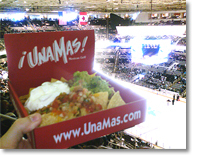 The food is good, it’s subsidized, and they serve nachos at least once a week. But occasionally my co-worker buddies and I will head off campus to the local sports bar Tasty Subs. They’ve got delicious subs, a good selection of beer on tap (I’ll usually get a Fat Tire) and their nachos are damn tasty as well. Tasty Subs goes for the minimalist approach when building their nacho, which I appreciate. They start off with a good restaurant quality tortilla chip and pour on a generous portion or your traditional nacho cheese sauce. Then they layer on a handful of freshly cut jalapeno peppers and top it off with a ice-cream sized scoop of guacamole.